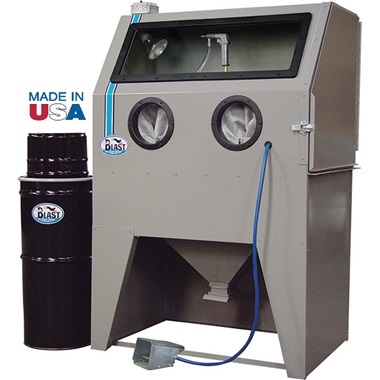 One of Our Best-Selling and Most Popular Abrasive Blasting Cabinets! The 940-DLX Deluxe Skat Blast Cabinet has become one of "America's Favorites". This model includes all the hardworking features that are standard with any Skat Blast Cabinet, plus all the customer-preferred features in one unit. Larger window for improved, brighter visibility when blasting and foot-pedal operation instead of trigger for operator comfort. Our 940-DLX removes rust, paint, and scale FAST! It is always ready. Leave the cabinet hooked up to your air supply, so it is ready for operation at a moment's notice (no air or abrasive is used until you need it). Clean oil pans, fuel pumps, wheels, carburetors, cylinder heads, nuts, bolts, springs, pistons, valve covers, hinges, a-arms, headlights, grilles, air cleaners, trim pieces, manifolds, interior and under-the-hood parts – the list is endless ... the results are amazing! Can also etch glass or blast designs in wood! 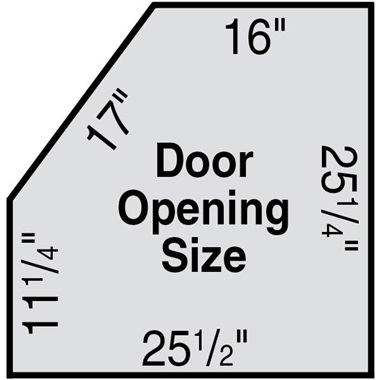 Easy to Use: Just insert rusty or painted parts through side-loading door and place on work screen. Close door, pick up part with one hand, press foot pedal, and aim USA-Made C-35 Power Gun. Each time foot-pedal-operated power gun is activated, rust, paint, and corrosion are removed FAST & EASY, leaving a beautiful satin finish on your part ready for painting or other final prep. Abrasive drops to funnel bottom where it is automatically recycled into "no surge" pickup tube and up to C-35 Power Gun. Vac-50 HEPA Vacuum provides excellent visibility. There is NO DUST OR MESS. 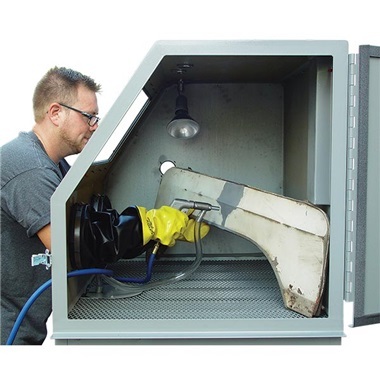 You always have a clean shop, as blast is confined inside cabinet. 3-5 HP air compressor required (10-15 cfm air @ 80 psi). SPECIFICATIONS: Overall size - 42"w, 30"d, 64-1/2"h. Work area - 40"w, 28"d, 28"h. 11 ga steel door with welded angle-iron framework, 22 ga steel body. Requires 10-15 cfm @ 80 psi. 125 psi max. 5 ft vac hose & Vac-50 HEPA Vacuum System. Fully Assembled. Crate size: 56"w, 34"d, 70"h. Ship wt: 350 lbs. IN STOCK - Ships Quick - within 24-48 hours! Made in USA! Ship wt 350 lbs motor freight. Unload or Liftgate Service is available for this equipment (extra cost, in addition to freight adder). Click on Unload or Liftgate Service in suggestions below for details. Great choice for light industrial! We replaced an order Chinese made cabinet with this one a few weeks ago. We have used numerous types of media to blast aluminum, steel, and cast-iron with great results across the board. Media flow is consistent and the factory lighting and vacuum keep visibility great. We use this cabinet between four and six hours per week and I cannot recommend it highly enough for metal prep. Pros: Shipping was fast. It required mimimal asembly. We use it to clean pump castings and pump impellars. It performed flawlessly. I like this unit. It's very well made. We use it in an industrial manufacturing plant for blasting scale off of heat treated parts before finish machining. It works great and is made in the USA. Service & Delivery comments: Delivery was fast and the unit arrived undamaged. Got our new cabinet a few weeks ago. We've been using it to clean up old Cruiser parts. Man does it make cleaning easier and faster. It's no longer the chore of scrubbing everything clean. Set up was easy and everything worked right out of the box. Service & Delivery comments: Delivery was super fast. We ordered on I think a Thursday and it was here Tuesday! !